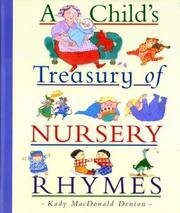 A collection of nursery rhymes provides children with rhyming skills and patterns. Over 100 nursery rhymes are remembered through illustrations, songs, and verse. Denton, Kady MacDonald, “A child's treasury of nursery rhymes,” Children's Picture Book Database at Miami University, accessed April 24, 2019, https://dlp.lib.miamioh.edu/picturebook/items/show/8938.